The mast head on this magazine cover is big, bold and stands out to the background and automatically catches the audiences eye and fits in with the rest of the magazine cover. The mast head is the biggest text on the page which shows it importance is higher than the rest of the text and also catches the audiences eye. The mast head is big bold white block writing which stands out compared to the black and white image and bright background and also runs over the top of the image to ensure that the audience can understand the name of the magazine, 'Vibe' which could have been used to link in with music as you can get vibes in music so it fits in with the genre of the magazine. 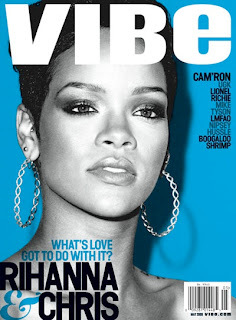 The image on this magazine cover is a close up of a celebrity singers face called 'Rihanna'. The subject isn't quite making direct address to the audience as she are looking slightly away from the camera. The image is in black and white and stands out compared to the brightly coloured background which automatically makes it the focal point on the page. In this image the subject is presented to be caring about her appearance as she has make up on and her hair done and also has visible jewellery on, which makes her the main focal point of the magazine which may appeal to the target audience. The anchorage text is very bold and big and runs across the main image and the black stands out compared to pale grey on the image. The anchorage text 'Rihanna&Chris' links in the rest of the page and gives more information about the main image and what may be inside the magazine which catches the audiences eye and makes them want to purchase the magazine. The colour of the anchorage text fits in with the rest of the cover and is also the second largest bit of text which shows it is quite important compared to the rest of the text. There are a few sell lines down the right hand side of the page and are all the same font and size but are two different colours which are black and grey and the black stands out more on the background compared to the grey which makes the black coloured sell lines look more important as it catches the audiences eye more. The sell lines fit in with the rest of the page and with the genre of the magazine. The colour scheme on this magazine cover is made up of blue, black, white and grey which a simple but effective and eye catching colour scheme. Blue is the dominate colour on the page as it stands out to the rest and is used as the background. The colour of the main image is links in with the rest of the colours on the page and the sell lines although the blue is very different compared to the rest of the colour scheme but works well with the colours on the page. The colour scheme matches well with the genre of the magazine as it is very eye catching and stands out to the audience. The bar code is located at the bottom right of the page and is small and doesn't get in the way of the image or any text but it is noticeable on the page. The layout of this magazine is quite simple but formal with the sell lines all beneath each other neatly and all the writing in straight lines. The cover is also minimal featuring as there are only a few sell lines and and colours creating a formal eye catching cover.